The Codex International Book Fair has been taking place at the Craneway Pavilion in Richmond. The fair runs until February 13, and includes over 175 of the world’s most distinguished book artists and artisans, private presses, and fine art publishers. Kala Art Institute had asked some of their artists to make artist books for the event. Now making an artist book for someone like myself, who gets covered in ink almost before I have opened the tin, turned out to be quite a challenge and an extremely steep learning curve. 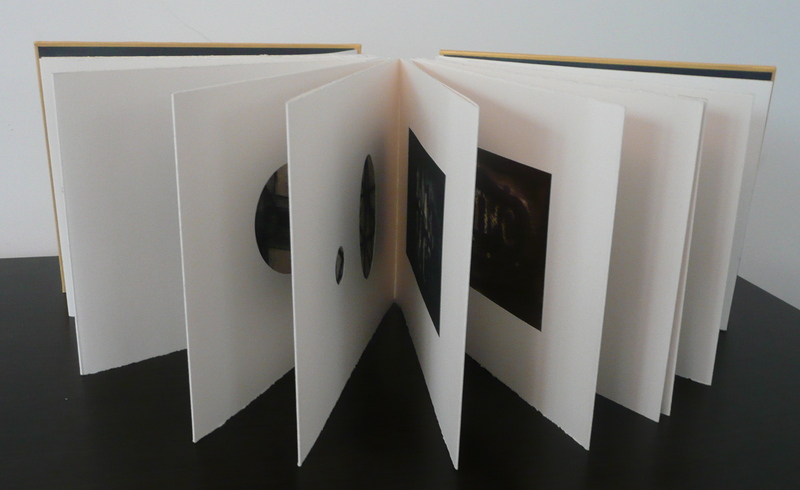 Does it really take nine 8 hour days to make a little book no more that 8″ x 10″? The book is based on a road trip I did last year to the amazing Neon Boneyard in Las Vegas. The images in the book of the neon signs are made from original drawings, pinhole photography and photopolymer plates. When the page is turned, you can get a glimpse from the rear of the page of the supports and structures that hold these signs together – the reality behind the Illusion. The book’s title page and supports are printed from drypoint plates. A bit of trivia about the venue for the Codex event, which is located in the Rosie the Riveter/World War II Home Front National Historical Park. The building was, before WWII, a Ford Motor Plant, which was converted to build tanks and jeeps at the breakout of the war, and was part of the Richmond Kaiser shipyards. Those shipyards produced 747 ships during the war, including the Red Oak Victory ship, which is moored there. It is a great place to visit, with sweeping views of the bay, city, and both Bay and Golden Gate bridges. This entry was posted in Exhibitions, General Stuff and tagged bookarts, fine art books. Bookmark the permalink.